The Northern China import price of 62% Fe content ore jumped again on Monday as the country's steelmakers stoke production ahead of mandated cuts going into winter. According to data supplied by The Steel Index the steelmaking raw material advanced 4% to exchange hands for $78.10 per dry metric tonne, the highest since April 7. The iron ore price is now trading up a whopping 47% from its 2017 lows struck just two months ago as Chinese anti-pollution crackdown on its heavy industries force the country's steelmakers to chase high quality imports and avoid domestic producers which contend with Fe content in the 20%-range. In Hebei province, China's key producing region, steelmakers said they will comply with stringent new emissions regulations by the September 1 deadline. 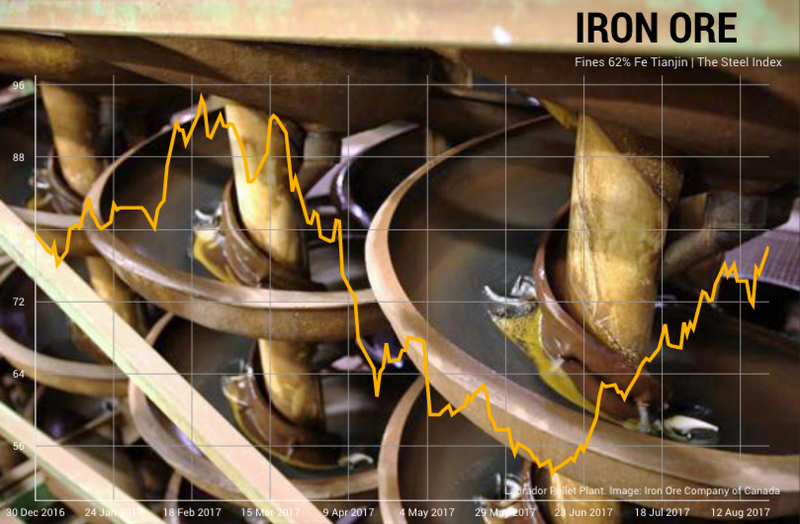 Iron ore's latest rally comes after another furious day of trading on ferrous derivates markets in China ahead of new curbs on trading going into force tomorrow to dampen speculative activity. In Shanghai rebar futures – the world's most traded steel contract – gained 3.6% near 4½-year highs. Dalian coking coal futures rose 3.6% while iron ore contracts closed 6.6% higher, bringing gains over the past three sessions to 11%. China's steel production last month rose more than 10% compared to last year to a record 74m tonnes as traders worry about a steel supply crunch going into the new year. Beijing wants to cut output by as much as 50% during winter months to fight smog, particularly in its capital city and surrounding areas. In Hebei province, China's key producing region, steelmakers said they will comply with stringent new emissions regulations by the September 1 deadline. Some 120 million tonnes of low-quality steel capacity were shuttered during the first six month of the year.